Hello again folks and welcome to another fantabulous pin-it party. 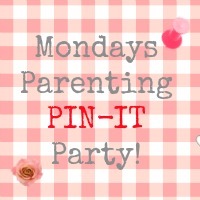 This weeks party is being hosted by the fabulous Helen over at Kiddycharts. Do pop over and see which of last weeks entries she has featured as her favourites. It could be you! Please do link up with us again this week. Dust off any parenting/family related posts and we will pin and share them for you. Remember this can be anything you like from a recipe, to a craft or tales of a recent trip or tantrum. The more variety the better. 3. Visit two other entries on the list that you like the look of, pin and leave them a comment letting them know you came from here and leave your pinterest ID. 4. For those Pin-It Party members that comment on your post, visit on pinterest and follow at least one of their boards. It would also be super lovely if you would like to link your post back to the host by either a text-link or by grabbing the badge. To add your post the magical linky-list awaits! Hooray, will pop on over for a nosey!